These reagents from High Desert Bioscience offer convenience and time savings for molecular biology researchers. 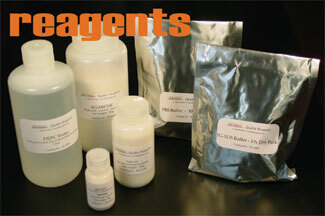 High Desert Bioscience offers these specialty reagents for increased convenience and efficiency in the lab. REA-1015 The proprietary absorbent in these destaining pouches allows for easy removal and safe discarding of EtBr and various other dyes in solutions/gels. Pack of 25. Look to High Desert reagents for reliability and convenience.